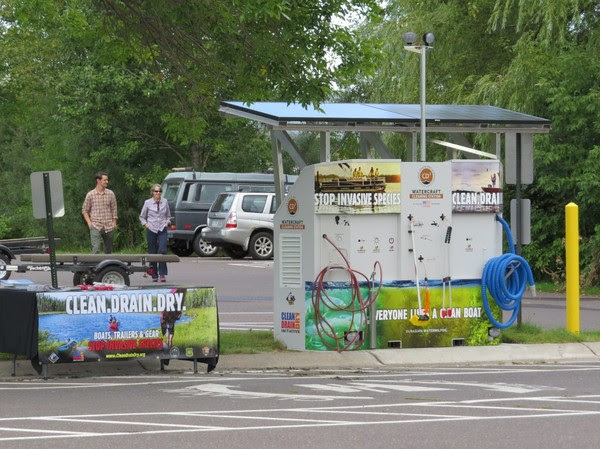 White Bear Lake, MN – Wildlife Forever has taken another innovative step towards fighting the spread of aquatic invasive species in the Great Lakes by donating a solarized watercraft cleaning station to the City of Duluth. Located within the St. Louis River estuary, the access at Munger Landing was recently outfitted with a CD3 Watercraft Cleaning Station to empower boaters to self-inspect and Clean Drain and Dry boats, trailers and equipment. In partnership with St. Louis County and the Minnesota DNR, the project highlights the importance of collaboration between state, county, city, private companies and conservation groups to bring real solutions in fighting the spread of aquatic invasive species. Munger Landing is the second access to be retrofitted with new cleaning station technology. In addition to providing physical tools to remove weeds and water, the new station will soon be outfitted with a Wi-Fi educational platform to highlight invasive species issues but also allow boaters to purchase fishing licenses, download lake maps and safe boating information. “The Great Lakes remain a major pathway for the potential introduction of invasive species,” said Pat Conzemius, Executive Vice President for Wildlife Forever. “I could not be more proud of the partners involved that worked together to enhance this access for AIS identification/prevention but also making a place for people to learn more about the resource,” said Conzemius. “The access at Munger Landing is a key location to the City of Duluth’s interconnected water trail and access to the St. Louis River, a crown jewel for paddlers, hunters, anglers, and birders. The station is a great complement to our awareness and prevention plans for preventing invasive species,” said Lisa Luokkala, Senior Parks Planner for the City of Duluth. Wildlife Forever’s Clean Drain Dry Initiative is a national campaign to educate outdoor recreational users on how to prevent the spread of invasive species. Strategic communications, marketing, outreach and educational services inform the public about invasive species prevention and consistent best management practices. Newly designed cleaning stations are waterless, user-operated and includes a wet/dry vacuum, blower, and tethered hand tools for easy use. The CD3 station is not your average cleaning station. The system has internet connected technology to allow natural resource managers to track visitor use, functionality and maintenance needs. About Wildlife Forever (WF): Wildlife Forever’s mission is to conserve America’s wildlife heritage through conservation education, preservation of habitat and management of fish and wildlife. For over 30 years, WF members have helped to conduct thousands of fish, game and habitat conservation projects across the country. Recent audits reveal a 94% to mission rating. Join Today! To learn more about the award-winning programs, including work to engage America’s youth, visit www.WildlifeForever.org.